By David Cannon, Jeremy Davis, and Garrett Gwiazda Weather Routing Inc.
What else comes to mind? How about tropical cyclones, adverse weather from trade wind surges, and even the effects from cold fronts? Maybe some of these things come to mind as well, but truth be told, mariners and vacationers alike should be aware of these weather concerns (and others) when traveling in this part of the world, so we’ll revisit this rather expansive area, and give a bit of a “refresher” if you will about the weather dangers to consider and what to look for in this part of the globe. Even the most experienced mariner must be wary of the potential weather dangers along the way…. without question this is one of the most important considerations for trip planning. Obviously, given the rather large coverage area involved, there are a wide variety of weather patterns and phenomena to consider. We will educate the reader on the best times of years to travel and the best course(s) of action to take to avoid exposure to adverse weather and make for an enjoyable time for all on board. Finally, we will explain the importance of utilizing weather providers as guidance for planning and routing. The period from November through April is known for significant surges of higher winds/seas across this region. These occur about every three to four days, occurring as large, cold high pressure ridges move east to southeastward and north of the area, across the Gulf of Mexico and into the Northern Caribbean. Wind surges are normally in the form of N-NE-E winds across the Central America, where winds can reach as high as gale force (force 8-9), especially across gaps in coastal ranges and across the Gulfs of Papagayo, Dulce, Nicoya, and Fonseca. Similar higher wind surges can occur in NE-E winds along the south side of the Peninsula de Azuero, found between Punta Mala and Punta Mariato. Large seas, as high as 10-12 feet, can also occur during these wind surges, particularly across more offshore waters, where N-NE-E “fetch” is greater. Farther north, across the Gulf of Tehuantepec, favored directions in wind surges are NW-N-NE, with N-NE winds in the western gulf, and NW-N winds further east. This occurs as northerly winds across inland valleys “fan out” across the gulf itself. Gale force winds are common in these surges, with severe surges in some cases bringing storm to hurricane force winds! Seas as high as 12-15ft can occur during wind surges (even as high as 20 feet in severe surges) across the mouth of the Gulf, with much lower seas found along immediate coastal waters. The weather turns more benign as we look farther north across the Mexican Riviera. Winds here are generally in the form of lighter W-NW-N winds, speeds generally not exceeding force 4-5. In fact, along immediate coastal waters (within approximately 2-3 miles from shore), and in cloud/rain free areas, winds will tend toward onshore sea breezes during the day (mainly occurring from mid morning through late afternoon), with offshore breezes at night and during the early morning hours. Combined seas will generally be from W-NW-N and long-period, heights generally no more than 6-7 feet, though larger long-period sets can occur, from surges of higher NW-N winds farther north. Across the Sea of Cortez, general wind directions are NW-N and tend to be light, with speeds generally no more than force 4-5. However, the passage of cold fronts north of the area and arrival of high pressure building in from the west will bring higher NW-N winds, with speeds approaching if not reaching minimal gale force, typically as high as force 7-8. NW combined seas during these wind surges will often reach as high as 10ft with locally higher sets, particularly along the southwestern coast of the Baja Peninsula. NW winds will generally “wrap around” the southern tip of the Baja Peninsula and become WSW-W, and during wind surges can reach near gale to gale force. However, with a more limited fetch in place, combined seas will generally tend to consist of a wind chop, typically no more than 4-6 feet across the region. During the remainder of the year (May through November), our attention turns toward the tropics. Tropical cyclone season begins on 15 May, and on average, we will find tropical cyclone development occurring in May about once every other year across this region. Development typically reaches its peak in late July and August, with cyclone frequency rapidly diminishing in September, October, and November (tropical cyclone season concludes on 30 November). Tropical cyclone development is most likely to occur off the Central American coast (south of 15N) and across adjacent offshore waters. 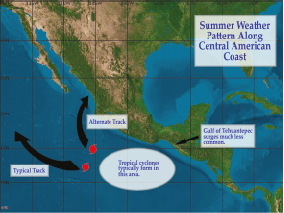 Typical tracks will be toward the West or West-Northwest, offshore from the Central American coast, weakening as they move into cooler waters near and west of 110W. An alternate track is one that will often take tropical cyclones on a more northwestward track, moving in the general direction of the Baja Peninsula and the Sea of Cortez. 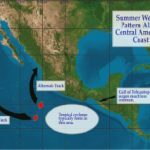 This is more likely to occur from mid/late August onward, as large troughs of low pressure in the mid and upper levels of the atmosphere more eastward toward the Baja Peninsula. Increasing SE-S-SW winds aloft in advance of these troughs will act to “pick up” and “recurve” tropical cyclones toward the northwest and north. Aside from the tropics, strong NW-NE-E wind surges are less common or uncommon along the Central American coast and the Gulf of Tehuantepec, as large cold high pressure ridges farther north decrease in frequency. Along Central America, NE-E winds are still in place, but tend to be lighter, normally no more than force 5-6, and tending to occur mainly across gaps in coastal ranges as well as across the Gulfs of Papagayo, Dulce, Nicoya, and Fonseca. This occurs as high pressure builds westward into the Western Caribbean and toward Central America. NE-E combined seas are generally no more than 3-6 feet, tending lower closer to the coast. E-SE-S winds are most dominant across the Gulf of Tehuantepec and “light”, with wind speeds generally on the order of force 3-5 and combined seas generally E-SE-S in direction, generally no more than 5 feet. W-NW-N winds continue to dominate farther to the north across the Mexican Riviera and the Baja coast, though wind surges are less prevalent here. Generally speaking, NW-N winds will not exceed force 5-6 near the Baja coast, with lighter winds further south, where pressure gradients are slackened. Along immediate coastal waters of Mexico and in cloud/rain free areas, “light” onshore sea breezes can be found during the day, with offshore land breezes at night, with generally long-period NW swells found, normally no more than 5-7 feet in the largest of sets. Strong and prolonged trade wind surges well to the south in the Southern Hemisphere will allow E-SE-S swells to propagate northward toward the region. These swells tend to be long-period, and are the result of the strengthening and building of a high pressure ridge south of the Equator. More on this later in this article. During the period of May through February, a general W-NW flowing current is found along much of the Central American coastline, from Panama to abeam Cabo Corrientes. During March and April however, ocean currents vary more in direction. The W-NW flowing current continues from near the Gulf of Tehuantepec eastward to Panama. However, from the Gulf of Tehuantepec to Cabo Corrientes, a south or southwestward flowing current develops. Further north and west along the west coast of the Baja Peninsula, the “cool” California Current provides a S-SW flowing current for much of the year. So when is the best time of year to travel in this region? What are the best routes to take? Both “winter” and “summer” patterns have their pros and cons. Overall, the best times to travel occur in May, and in October, when weather patterns are in transition, and tropical activity is far less likely to occur. 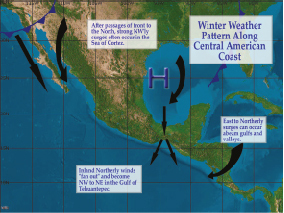 Winter season travel (November through April) offers a greater possibility of delays and/or stoppages due to adverse weather, particularly in NW-NE-E wind surges farther south (south of the Mexican Riviera), and NW-N wind surges farther north (across the Sea of Cortez and the Baja Peninsula). Routing options during the winter season become more limited as well. The best routing would be to maintain coastal routes. Taking coastal routing reduces the likelihood of encountering large seas associated with wind surges, especially farther south and in NW-NE-E’lys, and affords more readily available stoppage ports, should adverse weather become an apparent threat for onward travel. Two weather features are prevalent throughout the year across more northern waters (north of 10N): high pressure to the west and a thermal trough (low pressure) farther east. The thermal trough is normally found across the Sea of Cortez, Gulf of California, and the Baja Peninsula. The trough will tend to be weaker and cover a smaller area during the mid to late autumn months (November/December), during winter, and in early spring. 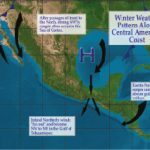 This is due to the presence of cold fronts moving southeastward into and across much of the western U.S. and (during the winter) into the northern Baja Peninsula, occuring about every three to four days. Later in the spring and during the summer/early autumn (May through October), the thermal trough tends to be stronger, with troughing extending as far north as interior/coastal California and Oregon. Weakening and a southward suppression of the trough will occur as smaller, weaker areas of high pressure “break away” from the nearly stationary high pressure ridge in the tropical/subtropical Pacific and into the northwest U.S. Weakening will also occur, as weakening cold fronts move southeastward into the western U.S., more likely to occur later in the period (in October), as cold fronts become somewhat stronger upon arrival along the U.S. West Coast. Farther west, a semi-stationary high pressure dominates across the tropical and subtropical Pacific, found mainly across waters between 40N and 10N and west of 110W. Slight flutuations in coverage and strength are likely to occur over a given time period. The ridge will tend to be weakest during the winter season (December through February), as larger, more intense gales and storms track slightly farther south from their summertime positions, but still well north of the region. However, transitory high pressure ridges moving into the Western Pacific will eventually merge with and “reinforce” the semi-stationary ridge, inducing surges of higher N-NE-E winds and larger N-NE-E swells across this region as well. The ridge will tend strongest during the summer months, as gales/storms in the North Pacific track further north. Looking south of 10N, the aforementioned ridge will interact with a broad east to west oriented trough of low pressure (equatorial trough), which on average covers the Pacific between 10S and 10N. During the late spring and summer months (May through August), the northern extent of the trough will normally be found closer to 10N, drifting southward later in the year, and reaching its southernmost location (near 05N) during December/January. With regards to tropical activity, cooler waters temperatures west of the Baja Peninsula, in particular those associated with the California Current (off the Baja Peninsula), will normally induce a weakening of tropical cyclones as they move farther west into this region. However, warmer water temperatures and lighter winds aloft can and do allow for tropical cyclone development during the summer months in more southern waters, mainly south of 20N. Such cyclones that form in this region will in the vast majority of cases track westward, weakening and/or passing south of the Hawaiian Islands. NW-N-NE winds dominate across waters between the Baja Peninsula and approximately 115W-120W, generally “moderate” to “fresh” in intensity. However, surges of higher winds will occur, mainly during the late autumn, winter, and spring months, as surges of cooler air move in behind cold fronts. Large NW-N-NE swells will accompany wind surges, often near and in excess of 10 feet, though will tend somewhat lower and longer-period in more southern waters. Easing of winds and an abatement of seas will occur as ridging further west weakens, and as cold fronts approach the region from the north and west. NE-E trade winds are dominant further west toward the Hawaiian Islands and in more southern waters (to 10N), speeds generally no more than force 5-6, with combined seas generally as high as 7-8 feet. However, merging of high pressure ridges will bring about periods of higher NE-E winds, which at times will reach gale or near gale force (force 7-8), along with larger NE-E swells, as much as 3-5 feet higher than those mentioned under “normal” circumstances. The approach and passage of stronger cold fronts north of the area will bring breaks in the NE-E wind/sea regime, normally lasting for 1-2 days at a times over a given location. Winds will actually tend to vary from E-SE-S becoming “gentle” or “moderate”, speeds mainly from force 3-5 and no more. Combined seas, in turn, will become more E-SE in direction and abate, generally not exceeding 6 feet, especially in more prolonged lulls in winds. The largest of these combined seas will tend to be mainly swell, with little wind driven “chop” on top of the swells. Once you are south of 10N, you are getting close to and within the “Doldrums”. Winds become lighter, and vary from NE-SE-S, with NE-E winds found north of the Equatorial Trough axis, and E-SE-S winds found further south. Wind speeds within this region tend to be from force 3-5, and near/below the low end of this range along or very near the trough axis. Combined seas become long-period and tend mostly swell with NE-SE-S seas averaging from 3-6 feet. 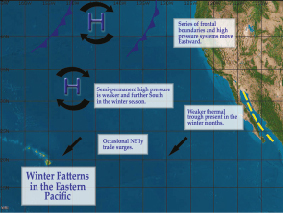 Slightly higher long-period sets (generally 1-2 feet higher) will occur in higher trade wind surges, typically in NE-E sets from high pressure to the north, or E-SE-S sets from ridging further south, in both instances occurring when ridging is stronger (toward/during the winter season). Disorganized squalls within the Equatorial Trough will bring localized periods of higher winds and combined seas (both in and near squalls). Squalls often bring periods of reduced visibility, with heavy/severe squalls bringing visibilities below 2 nautical miles at times. Prevailing currents more or less will fall in line with dominant wind directions. The already-mentioned California Current runs from north to south more or less parallelling the west coast of the Baja Peninsula and found just offshore. Increases in current speed and a southward “expansion” of the current will occur during stronger wind surges, associated with the passage of cold fronts during the period from late autumn through early spring. Farther west, currents become a more favorable southwest to westward moving direction. As one might imagine, the key in finding optimal weather winds and routing for westbound transits is in finding the trade winds and avoiding wind surges for the best possible ride. This means avoiding the passage of cold fronts late in the year and during the winter and early spring, thereby minimizing exposure to higher NW-N-NE winds. By allowing for weakening of the high pressure ridge farther west (normally in advance of cold fronts), lighter NW-NE winds and lower, longer-period NW-NE combined seas will allow for a smoother passage across eastern waters, east of 115W-120W. Once farther west and in the trades, travel typically becomes easier. Winds and seas are more or less all following, and the main concern, particularly for less “heartier” vessels becomes higher NE-E winds/combined seas, as high pressure ridges merge late in the year and during winter/early spring. For such lengthy transits across this region, wind surges are almost always a factor to consider, especially during this period. Of course, while summer means less wind surges and overall lighter conditions, it also means one will have to be mindful of the tropics, particularly those cyclones that form in more southern (near/south of 20N) and western waters. Wide “searoom” and sufficient fuel range of vessels will certainly afford route alterations for safe passage around such systems. The weather in this part of the world tends to be (for the most part) rather quiet. The main concerns over the course of the year will be enhanced N-NE winds from late fall through early spring (November through April) and squalls, especially later in the year (later spring/summer). “Periodic” (1-2 day duration) higher N-NE winds mainly occur across the Gulf of Panama and vicinity, occurring as large high pressure ridges build into and across much of the western and central Caribbean from the north and west, interacting with a rather persistent thermal trough (low pressure) along/near the northwestern coast of South America. Higher wind surges can occur during the spring, summer, and early fall, but are less pronounced, meaning gale force winds are less likely to occur, and are mainly due to a westward building of a semi-permanent high pressure ridge, building into the western Caribbean from the north and east. Looking farther south toward the Galapagos, the main weather feature in place is a broad, elongated trough of low pressure, oriented east to west across the equatorial Pacific. It is on the northern extent of this trough that we find the so-called “Inter-tropical Convergence Zone” (ITCZ), where N-NE-E winds further north “converge” with SE-S-SW winds further south, and where clusters of showers and squalls develop and move in a general westward motion across the Eastern Pacific. 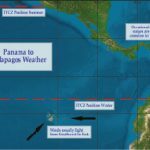 During the summer months, the ITCZ is about as far north as one might expect at any point in the year, generally found about as far north as 12N-15N. As time goes on, the ITCZ progresses farther south, and by December/January, it reaches its southernmost point, generally between 02N and 05N. Squalls within the ITCZ are generally disorganized, especially later in the year when the ITCZ is situated farther south, bringing only periodic and localized areas of higher winds and seas, along with reduced visibility. However, as we get into Tropical Season in the Eastern Pacific, more persistent squall areas can and do become tropical cyclones, primarily in waters farther west, west of the Gulf of Panama. Once south of the Gulf of Panama, the weather to the Galapagos tends to be (for the most part) rather benign. General wind directions are E-SE-SW and for the most part, light, no more than force 3-4. Of course, squalls within the ITCZ will bring higher winds and seas and periods of reduced visibility (below 2 nautical miles in heavy/severe squalls), but these bouts of adverse weather tend to be rather localized, confined to areas in or near squalls themselves. Combined seas will generally vary from E-SE-SW, no more than 5-6 feet south of the Gulf of Panama. However, stronger and prolonged trade wind surges in the Southern Hemisphere will at times bring larger, long-period E-SE-S swells, generally as high as 7-8 feet. This is most likely to occur during the period from mid to late spring (May/June) through early to mid-Autumn (late October/November), when high pressure in the Southern Hemisphere tends to be larger and stronger than during other times of the year. 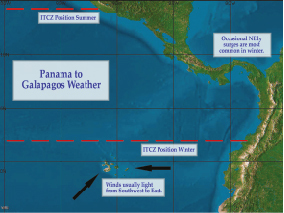 For most of the year, a countercurrent is centered about 150 nautical miles south of the Gulf of Panama. Closer to the Colombian coast, the current flows northward. This is part of the cool Humboldt Current, which feeds into the east to west moving South Equatorial Current farther west. Along 81W, the current flows southward, and is weakest during the winter months. Otherwise, from this countercurrent southwest to the Galapagos, a W-NW flowing current is typical, varying little throughout the year. These currents usually provide a favorable boost for transits from Panama to the Galapagos, with only a small negative impact for northbound transits. It’s pretty much trade winds all the way here. That’s the dominant wind regime in place across this part of the world. More specifically, we’re talking about E-SE winds, as the aforementioned broad equatorial low pressure trough interacts with a rather persistent high pressure ridge farther south. Over the course of the year, we will see an overall northward/southward “oscillation” in the positioning of both the trough and ridge, farther south during much of the latter half of the year (late July/August through December), with a northward progression during much of the first half of the year. E-SE winds will generally tend to be higher the farther south one travels, further away from the axis of the equatorial trough. Generally speaking, wind speeds will not exceed force 4-5, though merging of high pressure ridges will bring general 1-3 day periods of winds as high as force 6, particularly during the period from May through October, when trade wind surges are most common. Combined seas will generally be E-SE in direction, no more than 7-8 feet, and will tend to be lower and longer-period, consisting mainly of E-SE swells the further north one travels, where lighter winds are more common. Breaks in the E-SE trade wind regime will occur when slowing/stalling and weakening frontal systems yield more N-NE-E winds. 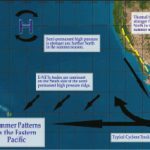 This is most likely to occur near and west of 160W and during the period from May through September, when cold fronts in the Southwest Pacific tend to advance further east before any stalling/weakening occurs. N-NE-E winds are generally from force 3-5, with E-SE combined seas lowering and becoming long-period, mixing with N-NE-E sets of no more than 5-6 feet. 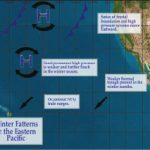 The Eastern and Central Pacific: 10S to 30S and East of the International Dateline To South America:Again, high pressure is dominant, especially across eastern waters and during the period from November through April, when cold fronts are less prevalent. This means more E-SE trade winds, which will tend to be stronger, reaching gale to near gale force, during wind surges that occur when merging of high pressure ridges occurs. E-SE combined seas tend to prevail as well, longer-period as one travels further north, closer to 10S where higher wind surges are less severe (typically no more than force 6). Sea heights will generally range from 5-9 feet across the area. However, during wind surges, larger sets, as much as 3-5 feet higher can occur, especially across more southern waters (south of 15S-20S), where wind surges are more severe and there is more of a shorter, wind-driven component to the seas. Breaks in the E-SE wind regime will occur as cold fronts move into the region. This is most likely to occur in waters west of 140W during the period from May through September, with fronts eventually slowing, stalling, and weakening near/west of 140W. In this region, cold fronts and resultant weakening of high pressure farther east will induce a veering of winds to more of a NW-N-NE direction, speeds generally from force 3-5, with combined seas lowering and becoming longer-period, generally no more than 6 feet. The tropical season for this region occurs primarily during the period from November into April, and only in the extreme western portions. The peak months for concern are January/February, as ocean waters are warmest during this period. During May through October, tropical concerns are just about non-existent due to cool ocean water and stronger winds aloft. In this region, typical tropical cyclones develop in the Solomon Islands to north of Fiji, and typically track southeast or south-southeastward to the dateline or 175W. After crossing the dateline, systems typically weaken rapidly due to cooler water further south. Tropical systems rarely form east of the dateline, and never near South America, although, El Nino regimes, particularly stronger El Ninos that are associated with well-above normal sea surface temperatures can allow for cyclone development well east of the dateline, as far east as 150W (certainly a rarity under “normal” circumstances). Once formation occurs, these “rare” tropical cyclones will tend to track in a general W-SW-S’ward motion, weakening as they get further south (south of 25S, in cooler waters and a more “hostile” environment in the mid to upper levels of the atmosphere). 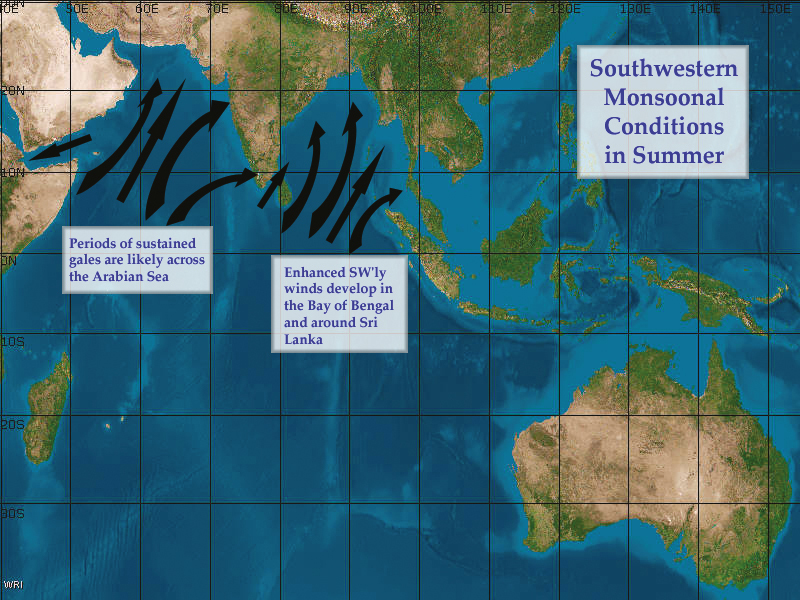 Ocean currents vary greatly throughout this region. 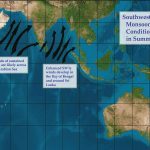 From 10S southward to about 25S, a generally westward flowing current is found through much of the year, due to the dominant trade winds that are found here. Further south, from 25S to about 30S is a transition zone. Here, currents tend to flow southwestward from 25S to 30S, and southward from 30S to 35S. From 35S to 40S, ocean currents tend to flow southeastward. No matter the time of year, this part of the world has a wide range of weather. From the volatile and ever changing to tranquil and persistent, from serene to tempestous….this area has it all. 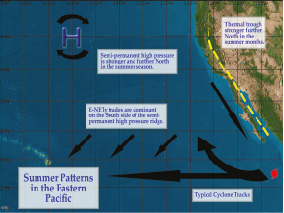 Two distinct weather regimes are to be noted: winter (more frequent/stronger cold fronts, transitory high pressure ridges, and trade wind surges), and summer (weaker, less frequent cold fronts and tropical cyclones). During late autumn and winter/early spring (May through October), we find cold fronts moving off of the eastern coast of Australia about every three days or so, generally extending as far north as 20S. Fronts then continue their trek across the Tasman and Coral Seas, finally slowing/stalling and weakening once near/east of the International Dateline, with forward progress slowed by the presence of persistent large high pressure further east. In the wake of fronts, high pressure ridges “emerge” into the Tasman and Coral Seas, eventually merging with and reinforcing the aforementioned persistent high pressure ridge farther east. These “transitory highs” are responsible for higher than average E-SE-S winds across much of the area, particularly south of 15S-20S, where winds as high as gale and near gale force and E-SE combined seas as high as 13-15 feet are certainly not unheard of in this region. Aside from the higher than normal E-SE-S’lys, E-SE winds generally average from force 4-6, with E-SE combined seas generally from 4-8 feet. These winds will tend lower in far northern waters within this region (closer to 10S), and near the centers of high pressure areas moving offshore (light and variable winds are found under or very near high centers). Furthermore, E-SE combined seas will tend to be lower and longer-period the further north one travels. Breaks in the trade wind regime occur when cold fronts approach and pass across or south of a given location. North of 20S, where “true” frontal passages are less likely to occur, winds will tend lighter, with NW-N-NE winds generally from force 3-5 and longer-period NE-E combined seas lowering to 3-6 feet. Further south, interaction between cold fronts (and associated gales/storms further south) and high pressure ridging further east will bring higher winds/seas. Here, winds tend to veer, becoming NE-NW-WNW, increasing to as high as force 6-7, followed by S-SW-W winds as high as gale force (force 8-9), especially near/south of 25S-30S, with large S-SW-W combined seas likely, as high as 10-15 feet, shorter-period and larger further south, somewhat closer to gales/storms, and where stronger frontal passages occur. During the period from late spring through early/mid autumn (November through April), cold fronts become less frequent and weaker, and by December/January only extend about as far north as about 35S, reaching the southeast coast of Australia about every four to five days. With persistent high pressure found farther west (into/near the eastern Tasman Sea), fronts this time of year will slow and weaken more readily, doing so as they move into and across the southernmost Tasman Sea toward southern New Zealand. Transitory high pressure ridges behind fronts are less prevalent across this region. Rather, in between cold fronts, high pressure further east will build westward into and across the Tasman and Coral Sea, bringing “periodic” (generally lasting 2-3 days) higher E-SE trade winds, generally as high as force 5-6, with lighter winds (force 4-5) found further north, between 10S and 20S. Combined seas during these trade wind surges generally vary from E-SE-S, generally as high as 8-9 feet, but tending lower and longer-period the further north one travels. It is during this period that our focus turns toward the tropics. Tropical cyclone frequency increases during October/November, with cyclone development generally found in the northern and central Coral Sea, generally tracking southeast to southward, eventually weakening and becoming extratropical (non-tropical) entites in cooler waters south of 25S and/or merging with cold fronts further south. Tropical cyclone frequency reaches its peak in January/February in the southwest Pacific, and development areas in the weeks leading up to this period expands greatly. Development will occur as far east as 170E (again, during strong El Nino episodes, warmer than normal sea surface temperatures will even allow for tropical cyclone development to occur east of the International Dateline). and as far west as the Arafura Sea and Gulf of Carpentaria. Those cyclones that develop further west (from the Coral Sea westward) will at times track south to southwestward toward and into northern and eastern Australia, with systems weakening as they move inland. Otherwise, general cyclone tracks this time of year will be southeast to southward, weakening as they move into the cooler waters near/south of 25S to 30S. Tropical cyclone frequency diminishes once again during the period from March through May, with development by May generally confined to the Coral Sea, tracking southeast to southwestward, either weakening as they move into northeast Australia, or weakening as they move into cooler waters and increasingly hostile conditions in the upper levels of the atmosphere south of 25S. The fastest-moving currents in this region are found north of 10S and just west of the International Dateline to 170E. These are east to west moving currents, part of the South Equatorial Current (found just south of the Equatorial Countercurrent), and show little overall change over a given time period. As one travels farther south, prevailing currents tend to become more northeast to southwest oriented. Currents along the coast actually become more north to south oriented as the South Equatorial Current turns and becomes the “warm” East Australian Current. Current speeds here also tend to slow in waters further south, becoming progressively slower the further south one travels and further offshore from the Australian coast. During the summer/winter months, average current speeds are higher as compared to during spring/autumn. – What Are Your Travel Options? Now that we know what to expect in the South Pacific, which way do we go? When do we travel? Well in equatorial regions (north of 10S), there really is no “best time” to travel, as weather across the region (aside from any squalls one might encounter) tends to be fairly benign and (for the most part) persistent over a given time period. Generally following/quartering conditions are found in NE-E-SE winds, with generally long-period swells and fast-moving westward moving currents. Staying north of 10S will in the vast majority of cases offer a good ride in what will generally be following conditions. Looking farther south toward 20S and in central and eastern waters, general trade winds are also found, but this area also offers a greater possibility of encountering higher winds and larger, shorter-period seas. This is especially the case during late autumn and winter/early spring when trade wind surges from merging high pressure ridges are more common. Currents also tend to slow some, but for the most part are favorable east to west moving currents. In the southwest Pacific, there are “pros” and “cons” to be found, regardless of when you wish to travel. During late autumn as well as during early to mid spring, our concerns of encountering a tropcial cyclone are non-existent, but remember that the weather during this particular time of year can be quite volatile and changeable, as cold fronts and following high pressure ridges become stronger and more frequent. Finding weather windows during this period can be difficult at times, but not impossible, and will be highly dependent on properly timing cold fronts, and the arrival of lighter and more favorable weather, as high pressure ridges move further offshore. When travel is a must and cold fronts become a factor in routing, one should consider more northern route, staying north of a direct course toward the Australian coast (and keeping stoppage/”bail out” ports in mind) to reduce/minimize exposure to adverse weather conditions (quartering/head winds and large NW-SW-S combined seas) from fronts. During summer, the opposite holds true, cold fronts are much less of a factor, and more direct routing is possible. However, we now need to watch the tropics closely, especially as we get into early/mid summer (January/February), when tropical cyclone activity nears and reaches its peak. Weather windows will be highly dependent on tropical cyclone activity and again, mariners who travel during this time need to be mindful of stoppage ports along the way….prepare for delays in departure when a tropical cyclone is already in or might move into your routing path. Failing that, alternate routing options will need to be considered to increase sea room around cyclones. The most optimal times to travel will be when weather regimes are in transition, from winter to summer and vice versa. During April, tropical cyclone activity is usually diminished, with cold fronts somewhat less of a factor than their wintertime counterparts. Likewise, in October, cold fronts tend to become as we progress through the month, and tropical cyclone activity is less frequent than later in the spring and during much of the summer. As one can see, there’s a lot to consider and potential dangers to avoid along the way when making such a long transit. Questions invariably come to mind when making such a long trek to Australia: What is the best route to take? When should I travel? What do I do when adverse weather is on the way on my present course? That is where the guidance of a professional weather routing and forecast service comes in. We provide the answers to those questions and more, making for ease in travel planning, wherever your final destination may be. To put it another way, we are more than merely authors. We are forecasters and part of a routing and forecasting company that prides itself in taking the time to constantly monitor vessels and meteorological/oceanographic data, both prior to a vessel’s departure and while underway. This takes the guesswork away from captains, allowing for ease and peace of mind knowing there is someone “watching over you” and always available to provide proper guidance, be it from initial routing and providing forecast information, or to advise of changing weather conditions and alternate route recommendations promptly when conditions dictate. Awareness is always key. By knowing what to expect and using proper guidance, any yachtsman can be rest assured that he/she knows what lies ahead and can avoid any potential danger. It is this awareness that will make for enjoyable trip…the trip of a lifetime that will be remembered by all for years to come. David Cannon is Yacht Operations Manager and Senior Meteorologist, Jeremy Davis is a Senior Meteorologist, and Garrett Gwiazda is a Meteorologist. All are employed at Weather Routing Inc. (WRI Ltd.), which has provided professional routing and meteorological consultation to mariners worldwide since 1961.